It may have only been one season, but it was one to remember. 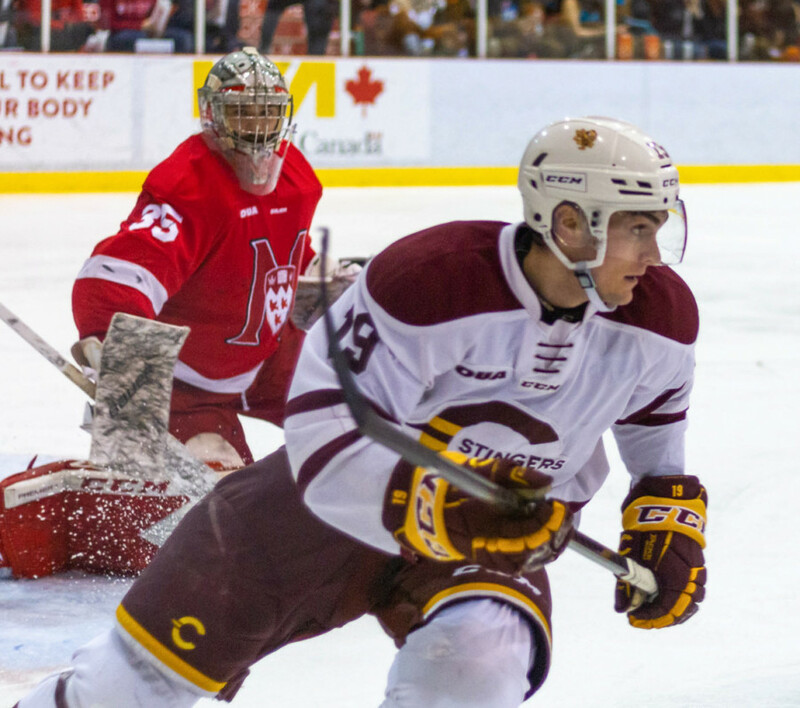 The Concordia Stingers’ top line centre is moving on after a dominant rookie season. Hugo Roy recently signed a three year contract with the Milwaukee Admirals, the American Hockey League affiliate of the NHL’s Nashville Predators. “It feels great. I’m excited. It was my goal coming to Concordia. I knew that I would have the opportunity to play a lot. It was my goal to get a pro contract. Mission accomplished,” said Roy. Instead of speaking at the team’s exit meetings and going over what to improve on ahead of next season as expected, Roy and Stingers head coach Marc-André Élement texted each other end of season messages. From his plane headed for Milwaukee, Roy thanked his coach for the confidence, encouragement, and guidance he had received over the course of the season that had ended just three days earlier. Élement told his now former player that he would always be there for him and to call anytime if he had any questions. Regardless of the fact that he was losing his best centreman—arguably hockey’s most important position—he was just happy to see Roy starting his professional career in the AHL. “I’m really happy for him. It’s going to hurt us on the ice for sure, but that’s what you want. You want your guys to graduate and play pro. He’s one of a kind, a special player and we were fortunate enough to have him for one year at least,” said Élement. In early 2018, Roy was finishing up his junior career with the Sherbrooke Phoenix of the Quebec Major Junior Hockey League. It wasn’t a particularly remarkable career outside of a strong 30 goal season, two years before he joined the Concordia Stingers. He signed with the Stingers, a team filled with strong centres, including league MVP Anthony Beauregard. Roy was expected to come in and be an impact player, but at least be surrounded by a roster of experienced and offensive talent that had just brought the Stingers to nationals. But then Beauregard got a pro contract and left at the end of the 2017-2018 season. Rookie all-star Massimo Carozza, who played both centre and wing, left for a contract with a European team. Reliable veteran centre Raphaël Lafontaine graduated. William Gignac, a young fast centre, left the program as well. This left a hole in the top centre position despite the presence of now second year centre Jean-Philippe Beaulieu and the addition of recruits Chase Harwell and Zachary Zorn. From the first time he got into game action in the preseason, Roy was expected to step up, playing between graduating captain Philippe Hudon and top winger Philippe Sanche. He was on the top power play and penalty kill units, but said the pressure was never stressed him out. Instead, it excited Roy for the season and challenge ahead of him. “I was confident and open to a new environment. I was happy to go on my own and reach a new step,” said Roy. He had reason to feel confident. In his first preseason game, a 4-1 win, he scored twice and added an assist as well. That strong start of the season and general success didn’t surprise a former teammate of Roy’s. Stingers defenceman Carl Neill was Roy’s captain in Sherbrooke, and helped recruit his old friend to Concordia when his time in junior was done. The captain’s C even passed from Neill to Roy when the former left Sherbrooke. “It’s crazy to see. When he first came into Sherbrooke, he wasn’t an impact player. You could see the potential [though]. He was a good skater and worked hard,” said Neill. The young centre was an impact player from start to finish this time around. The jump from major junior to U Sports didn’t seem to bother him as the increased speed, physicality, and age of players seemed to fit his game, if anything. He said playing with older players that know what it means to act like a professional and fight for a contract was something he took advantage of, taking in as much as he could from his linemates. Sanche said he liked how Roy would consistently, and vocally, be analyzing plays and opponents during games. Sanche, Roy, and Hudon spent time discussing everything they saw on the ice. “We’d talk a lot on the bench after plays. He’s just so fun to play with. He’s fast, he works hard. He’s always getting open so it’s easy for [us] to give him the puck,” said Sanche. Roy certainly had the puck plenty and took advantage of it, scoring 19 goals and 26 points in 28 games. He was fifth in overall goal scoring in Ontario University Athletics and tied for first in powerplay goals. Looking at it nationally, he tied for seventh in goals scored. For all the success he had on the ice and strategy talk with his teammates, he’s pretty quiet away from the game. The coach may as well have been describing his centre’s playstyle. Roy’s game was an extremely productive one, but never flashy. Efficiency is the best word to describe it. There was never wasted energy in Roy’s play or the need to rush and catch up to plays that he missed. If there is one part of Roy’s game that fans will remember, it’s his shot—the powerful, deceptive shot, with a dangerously quick release. Along with his defensive game, it’s the thing that teammates bring up first. 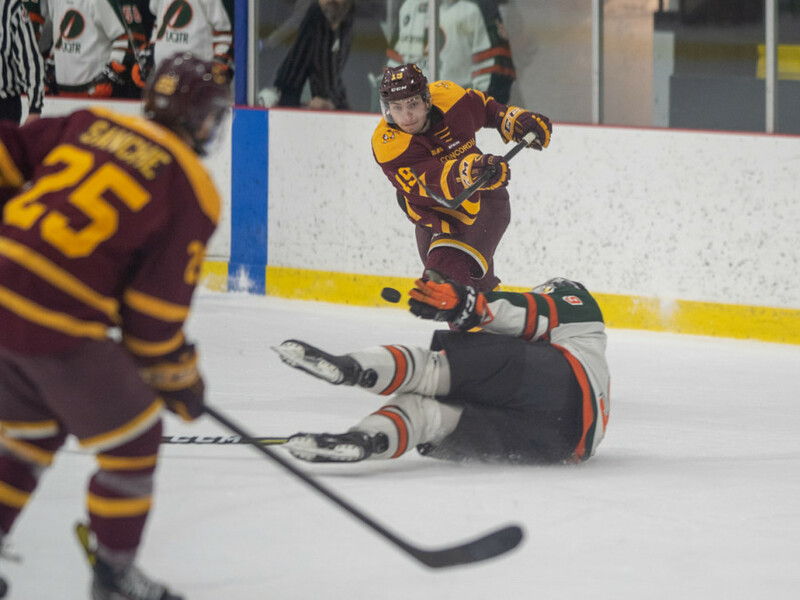 He used it plenty this past season, perhaps most memorably for the game winning goal against McGill to secure a Corey Cup victory against the team’s crosstown rivals with a blistering one-timer. While it was strong from the start, Roy’s game developed over his year at Concordia. He said playing in a league of 25-year-old’s, and succeeding, after five years of going up against younger players, is a confidence booster. He described himself as a much smarter player by the end of his season under Élement. While the Stingers head coach also believes Roy is ready for that next level, calling him “close to the NHL,” even he was surprised when the newest Milwaukee Admiral called to tell him his good news. Élement had expected Roy to be around for more than a season to work on his degree, but, unfortunately for coaches, that’s the way of university hockey. There is no ill will between Roy and his ex-coach or teammates now though. When the contract comes up, they always describe it as a deal one has to take if offered. The AHL is just a step below the NHL. It comes with a chance for advancement, solid pay, and very high level hockey. It’s the league many U Sports hockey players dream of. That’s where Roy has found himself now. A year of impressive, efficient, dominant hockey earned him a spot in a league of top tier talent, a shot at a full-time professional position, and a chance to continue his dream. Not a bad finish to his first, and only, U Sports season.